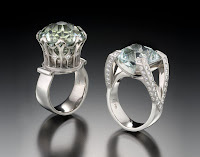 For the Love of Jewels...: Lisa Krikawa: Wonderful Wedding Rings and more! 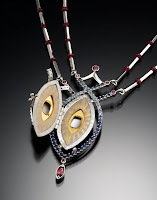 I heard about Lisa Krikawa of Krikawa Jewelry Designs upon learning that she won the latest Mort Abelson Scholarship to the Revere Academy Masters Symposium. It was the first contest I’ve entered as a jewelry designer. I didn’t expect to win, but I approached it as a new experience to learn how these things are done. It took me hours just to figure out how to submit the photos properly! So when I learned that a winner had been selected, I was fascinated to find out that it was Lisa. 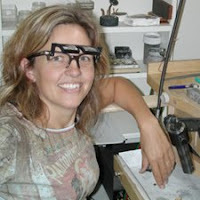 Lisa specializes in custom wedding rings and unique lockets. She is more than a single artisan; rather she has emerged as a small business owner with a staff of skilled goldsmiths. Congratulations on your win of the Mort Abelson Scholarship to the Revere Academy Masters Symposium. What class will you take and what do you hope to get out the experience? I am taking the micro-pavé class with Christo Kiffer. 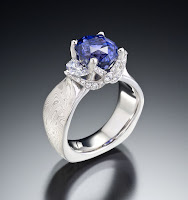 He is a master of micro-pavé, and an internationally respected, award-winning jewelry designer and goldsmith. Christo's vast experience includes a specialty in diamond setting which lead to his signature "Floating Channel" designs. I will be learning to set diamonds as small as .003ct, which is about the size of a ball on the end of a fine ball-point pen. I am a sucker for fine, microscopic detail. Truly fine jewelry should retain it's beauty under magnification. 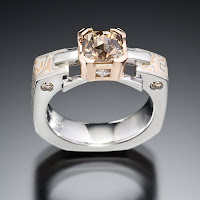 Your work seems to specialize in interesting and unusual wedding rings. Why is this your focus? I have a hard time with making jewelry just to make pretty jewelry. My passion lies in putting my talent (and that of my extremely talented staff) to use by making something that is meaningful. One of the most rewarding experiences for me in this business occurs when I collaborate with my client and my staff to create a beautiful wedding set that is designed around our client's specifications and brought to a fabulous 3-D existence by my creative team. As it turns out, this is an incredibly meaningful experience for our clients as well, and the icing on the cake occurs when we get their response to the final rings and their exceptional experience with us. What appeals to you about mokume-gane? Do you make your own? From the beginning, I have considered myself a metalsmith first and foremost. As an artist, my preferred palette has always been the palette of precious metals, from green gold to gray gold and all the colors in-between. Mokume-gane was a perfect medium for me. We hand-pattern our mokume in-house. You also do fantastic specialized work in lockets which is unusual....what do you like about creating lockets? Lockets are precision projects that contain meaning inside and out. Mechanisms such as hinges and catches give me a technical challenge, while the concept of hidden compartments capture my imaginiation. You have a larger staff and business than most art jewelers. What do you think it requires to come to your level of success? My greatest asset to my success has been my tenacious spirit and my business minded approach. I take nothing personally and look at nothing as a failure, only an opportunity for growth. My professional experience is enlightened by collaborating with other passionate and talented individuals, working together as a team, maturing and growing together, and resolving issues in a loving manner. What do you see as the particular challenges and opportunities during these economic times? The challenge of course is the consumer's general resistance to spending money. The opportunity is to help people express themselves through customized jewelry, as the general opinion of mass produced merchandise flags. What advice would you give to fledgling jewelry designers? Always follow your heart and do that which you are passionate about. Passion will provide sustenance regardless of monetary gains; it will sustain you in lean times. Enter into business only if you have a penchant for it, otherwise you will be miserable, bogged down in paperwork. Don't consider outside employment as a failure; rather use the time you have wisely and don't give up on your dream. And for success in any endeavor, embrace the four agreements: be impeccable in your word; don't take anything personally; don't make assumptions; and always do your best. We are each 100% responsible for our lives. Never, ever put blame on others. Let gratitude lead your way.